Gloucestershire, UK - Salvo code members, Ronson Reclaim have long built up a good reputation for their wide range of reclaimed building materials including flagstones, bricks, timber and roofing. Run by Ron Jones and son David the yard covers five acres and is based in an area that once housed an old brickworks. Now David and daughter Katie have decided to create another space to store and sell a collection of their more select salvaged items. In contrast to the rural setting of the salvage yard the new Gallery, showrooms are in a residential area of Longford opposite the Queen’s Head public house. 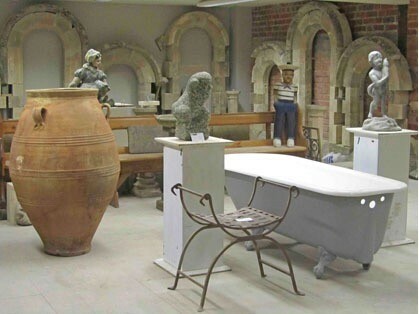 Items include exotic statues, marble-like cherubs, vases, busts, figurines, Americana, signage, pots, tiles and furniture for the home and garden. It has already attracted buyers from as far a way as Australia and the USA. It could be the perfect place to find that unique Christmas gift. The new showroom will be open to view on Saturdays from 10am to 3pm and weekdays by appointment only throughout November and December. Gloucestershire Live: Aladdin's cave of architectural treasures.